A can’t-miss recipe courtesy of Vedge Restaurant chef/owners Rich Landau and Kate Jacoby. My only change? 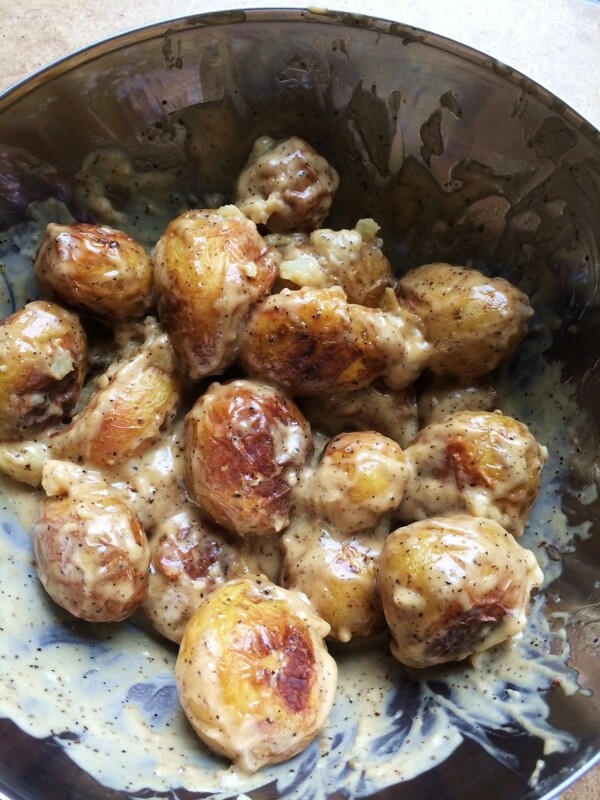 Using baby Yukon Golds instead of fingerlings. Choose your favorite. A can't-miss recipe courtesy of Vedge Restaurant chef/owners Rich Landau and Kate Jacoby. My only change? Using baby Yukon Golds instead of fingerlings. Choose your favorite. Toss potatoes in a bowl with the olive oil, 1 teaspoon of salt, and 1 teaspoon of pepper. Transfer to a sheet pan and roast for 15 minutes or until fork-tender. Remove pan from oven and allow to cool for a few minutes. While the potatoes are cooling, in a food processor combine the mayo, Worcestershire sauce, mustard, vinegar, sugar, and remaining ½ teaspoon of salt and ½ teaspoon of pepper, and pulse until smooth. Toss the warm potatoes in a bowl with the sauce and serve immediately.